I picked this article to read because I have seen this disease first hand while working at OARDC in Wooster, Ohio while I was helping with various research projects for my internship. While reading this article I learned that the Tobacco Mosaic Virus is caused by a virus that belongs in the Tobamovirus genus. This virus can then affect many plants, most commonly tomato and tobacco plants. The symptoms that appear on infected tomatoes include mosaic or mottling pattern on leaves, necrosis and yellowing of plant tissues, stunting of plant height, and leaf curling. After the symptoms become present in tomato plants it soon affects the fruit by delaying ripening, shape, and color which results in poor yields. Tobacco Mosaic can be spread in many ways. It can be spread indirectly by a healthy plant touching a sick plant, workers clothing or hands can carry the virus after smoking or using tobacco products, wounds in plant tissue, or contaminated seed. The virus can also remain infectious for years if the right disease conditions have not been met but, it can begin to thrive again once conditions are conducive for the virus. To avoid contamination or spread of this virus you should remove all unwanted plant debris and possibly infected soil from where you are trying to grow your crops. Wash all tools and surfaces with soap or a 10% bleach solution. You can also plant cultivars that were bred to be genetically resistant to Tobacco Mosaic and plant infection and disease free seed. Another helpful tip that was discovered is dipping your hands and tools into milk, which has been seen to inactivate the Tobacco Mosaic Virus. This virus is important to avoid because it would cost many losses in the growth and cultivation of tomato plants. This would cause a lot of economic loss, as well as time that was possibly spend on research toward advancing these plants if they were infected with tobacco mosaic disease. Sarah Miller is currently a senior studying agronomy at The Ohio State University. In spring 2017 she will graduate with her bachelor’s degree in agronomy. She plans to start working towards her certified crop advisor certification while working a full time job. 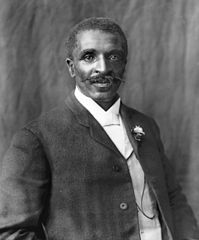 Martin Luther King Day is a good time to reflect upon the contributions of George Washington Carver, a groundbreaking agricultural scientist, plant pathologist and inventor. He was a pioneer in education, research, and agricultural extension. He developed innovative uses for peanuts and other crops, and he promoted cultural practices such as crop rotation. Born into slavery, George Washington Carver overcame tremendous obstacles to become the first black graduate of Iowa State. He would go onn to become a preeminent scientist and educator at Tuskegee Institute in Alabama. My name is Ben Shaw and I am a junior at The Ohio State University studying Agronomy and Agribusiness. I wrote this blog post because it conveys a serious problem that our nation and the world is going through. The history of agriculture dates back since around 10,000 BC. Since then, many changes have taken place that have affected how our modern image of food production occurs. This includes selective plant breeding, crop protection technologies, mechanization of farm equipment, and technological advancements over all of the agricultural industry. GMOs are widely used throughout the world, especially in the US, and are relied upon to feed the growing population. However, arguments are being made around the globe about the unsafe and hazardous conditions that these crops and livestock expose us to. Because of this, many people support organic farming. This farming differs in that no synthetic fertilizers or pesticides are used, and livestock are not treated with antibiotics or other hormones. However, is there even an actual difference in the finished product from conventional and organic agriculture? Many scientific studies indicate that eating GMO products pose no health risks to humans, and pose no threats. For example, Bt Corn contains a gene from a soil bacterium that will selectively kill insects that eed on the plants. Bt is also completely broken down in human bodies posing no health threat, but using this corn saves growers from using pesticides that are not as selective. I believe that our real argument shouldn’t be Organic Or GMO, but it should be: How can we combine these methods to support our population? Also known as horse weed, marestail is a broad leaf weed in grain crops. It is practically nuisance in soybeans that can get up to 6 feet tall if not controlled. This weed can be chemically or mechanically controlled. However, because it grows as a basal rosette you must make sure to get the whole root base in order to kill it if using a mechanical system of control. Anything that will kill a broadleaf can be sprayed to kill it. There is one problem with this weed. In the year 2000 it was first report of it being resistant to glyphosate. This caused a problem that if it was in in a soybean field traited to being tolerant of glyphosate then it would just laugh and keeping growing spreading the resistant population of the weed. Planting a glufosinate resistant soybean instead thus allowing for the destruction of the resistant marestail population and help increase yield.